I was inspired at dinner the other night to start something new here on my blog. I had just tried a new recipe, which I discovered through a link of a link via Pinterest. Anyway, I made it and saw that my oldest daughter devoured hers and asked for seconds. That never happens so I went around the table and asked everyone to rate it. So, I will begin to feature the recipes that we enjoyed and include how it was rated by me (is it easy and if not, is it worth the time, and taste), plus rating by the kids, and the hubby. This will be an occasional feature here and there cause we all know this is my scrap happy blog but I thought it'd be fun to share these family favorites. These recipes will be pinned to my Yumminess or Healthier Recipes boards on Pinterest along with many others or you can search the "recipe tag" at the bottom right of my blog to read reviews of the recipes or to see how I've modified the recipe for my family's picky eaters. Note that I have not yet tried all the recipes I've pinned but I plan to. Me: 3 1/2 stars - very easy to make; perfect for last minute snack or meal; I'm not a fan of mayo/miracle whip so I'd leave them off mine but add it to the other sliders for the family. Time: Took me all of 10-ish minutes to prep them and then another 15 minutes in the oven to warm them. 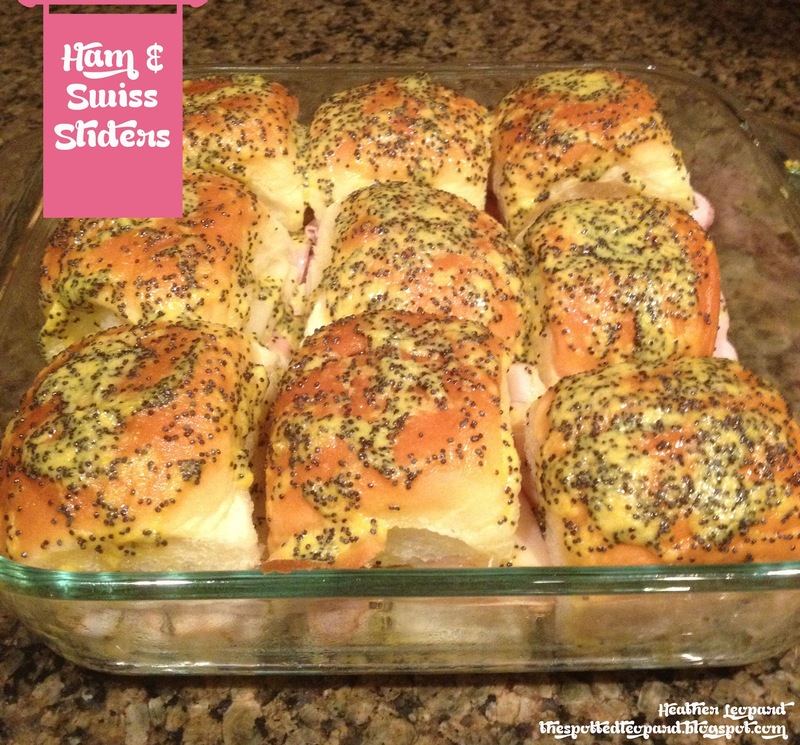 12 white dinner rolls - I used King's Hawaiian Rolls...Yummy! 1/2 Tbsp. poppy seeds - I suggest reducing this to 1/4 Tbsp. cause a little bit goes a long way and you can always add more if you want. In a small bowl, combine mayonnaise and miracle whip.Cut Rolls in halves. Spread mayonaise-miracle whip mixture on each side of the roll. 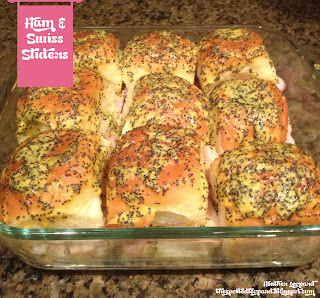 Place a piece of honey ham and Swiss cheese on one half of each roll. Fold back into sandwich form. Place rolls close together in a greased 9x13 pan until pan in completely full. A square 8x8 pan fit 12 rolls perfectly. Mix together all ingredients of Poppy Seed Sauce. Spread evenly over the tops of all the rolls. Use as much or little of the sauce as you want. Cover with aluminum foil and bake at 350 for 12-15 minutes. I've actually had these and they are YUM! GREAT idea for a new feature Heather!